Properties: Selenium has an atomic radius of 117 pm, a melting point of 220.5°C, boiling point of 685°C, with oxidation states of 6, 4, and -2. Selenium is a member of the sulfur group of nonmetallic elements and is similar to this element in terms of its forms and compounds. Selenium exhibits photovoltaic action, where light is converted directly into electricity, and photoconductive action, where electrical resistance decreases with increased illumination. Selenium exists in several forms, but is usually prepared with an amorphous or crystalline structure. Amorphous selenium is either red (powder form) or black (vitreous form). Crystalline monoclinic selenium is deep red; crystalline hexagonal selenium, the most stable variety, is gray with a metallic luster. Elemental selenium is fairly nontoxic and is considered an essential trace element for proper nutrition. However, hydrogen selenide (H2Se) and other selenium compounds are extremely toxic, resembling arsenic in their physiological reactions. Selenium occurs in some soils in amounts sufficient to produce serious effects on animals feeding on plants grown from those soils (e.g., locoweed). Uses: Selenium is used in xerography to copy documents and in photographic toner. It is used in the glass industry to make ruby-red colored glasses and enamels and to decolorize glass. It is used in photocells and light meters. Because it can convert AC electricity to DC, it is widely used in rectifiers. Selenium is a p-type semiconductor below its melting point, which leads to many solid-state and electronics applications. Selenium is also used as an additive to stainless steel. 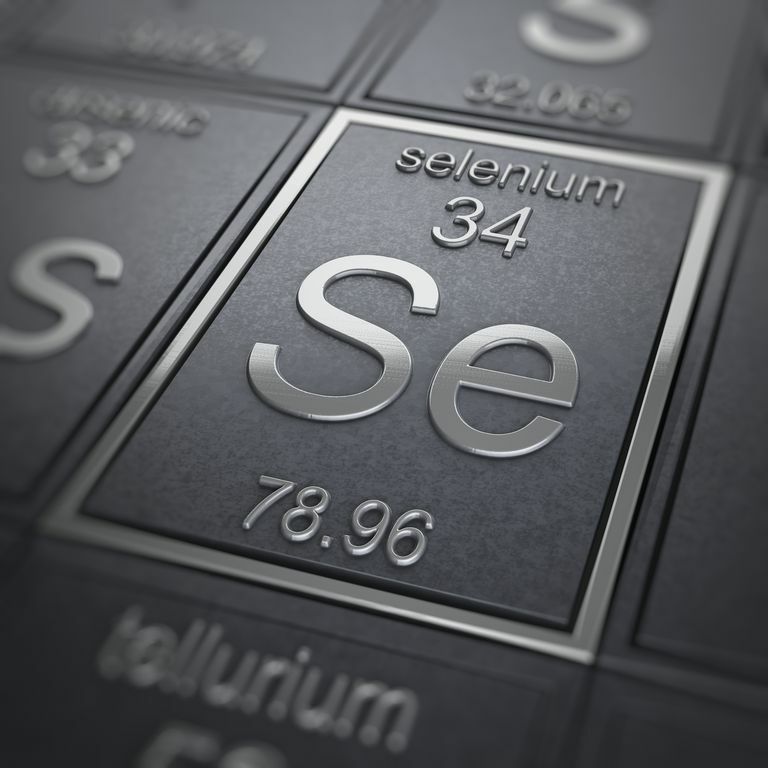 Isotopes: Selenium has 29 known isotopes including Se-65, Se-67 to Se-94. There are six stable isotopes: Se-74 (0.89% abundance), Se-76 (9.37% abundance), Se-77 (7.63% abundance), Se-78 (23.77% abundance), Se-80 (49.61% abundance) and Se-82 (8.73% abundance). Jöns Jakob Berzelius found a red sulfur-like deposit at a sulfuric acid manufacturing facility. He originally thought the deposit was the element tellurium. After further examination, he decided he had found a new element. Since tellurium was named after Tellus, or Earth goddess in Latin, he named his new element after the Greek Moon goddess Selene. Selenium is used in anti-dandruff shampoos. Gray selenium conducts electricity better when light is shined on it. Early photoelectric circuits and solar cells used selenium metal. Compounds containing selenium in the -2 oxidation state are called selenides. Brazil nuts have the highest levels of nutritional selenium. One ounce of brazil nuts contain 544 micrograms of selenium or 777% the Recommended Daily Allowance. Quiz: Test your new selenium knowledge with the Selenium Facts Quiz.